I can't help feeling that "Digital Done Right" is grammatically clumsy but I hope it gets across the essence of what I'm covering with this review. I've been committed to files-based playback as my digital source for around 7 years. I'm talking primarily WAV and FLAC playback for the purposes of this review. If you're one of the folks who say digital is simply zeros & ones so if it plays successfully that's as good as you'll get - stop reading now as you'll likely get upset if you continue. In some ways life is so easy with a CD player, you plug it in, insert a CD and it plays. You can tweak the CD player clock and power supplies but most people don't, so life is easy. Ripping your CD collection and purchasing downloads opens up easy access to your music collection and means you can shift your large CD collection into storage. You may find you start skipping tracks and just playing the most immediately enjoyable music; personally I tend to stick with playing albums as "quick fix" music, whilst fun, isn't necessarily the most satisfying in the longer term. Most people playing their music via a computer will be using a USB DAC linked to their Windows or Mac OS machine. The slightly more intrepid might be using a Raspberry Pi for playback; this will usually be via an S/PDIF connected DAC. From my years of trying to get the best out of my computer and files playback I know that it is not as simple as zeros & ones being all you need to care about. Computers are horribly noisy beasts with lots of scope for injecting Radio Frequency Interference into your DAC and generally messing up the resulting sound. For the purposes of this review I brought together three devices from Ciúnas Audio and one from Allo. This is not intended as a shoot-out but instead it is a journey through some of possibilities to improve on the sound of computer and files playback. The Ciúnas Audio devices assessed are the ISO-DAC, ISO-SPDIF and ISO-PS. All the Ciúnas Audio devices are battery powered but the batteries are not generic Lithium (Li-ion) types; they are the much more special LiFePO4 batteries. The ISO-DAC and ISO-SPDIF uniquely feature USB galvanic isolation and reclocking/reconstruction. Ciúnas Audio claim these devices were first on the market to include in-built, high-speed USB galvanic isolation & USB reclocking rather than as an external add-on. The Allo device is the DigiOne which is an add-on board for the Raspberry Pi. This endows the Pi with an S/PDIF coax-only output, this board includes a lot of power treatment plus the S/PDIF data stream is reclocked. What Questions Am I Wanting Answers To? How good are the latest USB isolation, reclocking and battery and power cleansing techniques; are they a step forward? Are general purpose computers or low cost specialist computers the way to go when streaming files to a DAC? Does the software player matter in terms of sound quality or do the latest reclocking techniques level the playing field? When you connect a USB DAC to your computer the unfortunate reality is that your hybrid digital / analog converter is then linked to an inherently noisy device. Your USB connection comprises four wires, two wires are for 5V DC power and the other two wires carry the data from the computer. The 5V wires can be used to power some of all of the DAC or simply be used to achieve a "handshake" between computer and DAC when they first connect. Either way there is a ground reference between the computer and DAC. Whilst you may hope that digital electronics is immune from a bit of noise on the power line, this does not seem to be the case. I'm aware that Ciúnas Audio finds that it is important to maintain a clean and noise-free ground reference. In some ways digital electronics are more demanding of power supplies than analog circuits; digital demands instant high current and if the ground reference is disturbed then audio performance will suffer. The two USB data wires are where the isolation challenge has been, this is where Galvanic (electrical) Isolation comes in. USB 2 comes with options for Low Speed (1.5Mb/s), Full Speed (12Mb/s) and Hi Speed (480 Mb/s). Most isolators run at Full Speed. If you want to be sure that your USB connection isn't a bottleneck you're going to want it to run at Hi Speed. Most USB digital audio devices now work at USB Hi Speed. The isolator used therefore is a critical component. Ciúnas Audio uses the Silanna Hi Speed digital isolator device which was the first such device on the market. In development Ciúnas experimented with chokes to try to eradicate common mode noise – that is noise which is present on both data lines – but noise is present at a broad spectrum of frequencies which chokes can't easily deal with; hence the Silanna device. So, job done, or so you'd think. It turns out that a side effect of all isolation devices is that there can be a very slight skew between the two data lines which is in effect jitter. No free lunch! The subsequent stage fixes any skew resulting from the isolation stage. This stage is the USB HUB; this is where the USB data is reformatted; this is performed via a Genesys USB 3.0 Hub device. In essence it's reclocked and regenerated from the original data to become "purified". If all this makes little sense to you just think of it as this is where the magic happens, or at least some of it. Not all USB DACs have Galvanic Isolation built-in, possibly because unless you attend to the potential already described side effects the resulting sound may not be what was expected. Of those DACs that do offer Galvanic Isolation I've seen a number which isolate after the USB receiver which as we say in English is "locking the stable door after the horse has bolted"; in other words it's a fine thing to do but it's a bit late. What I've described so far is the basis for the Ciúnas Audio ISO-DAC and ISO-SPDIF both of which contain this isolated USB hub (ISO-HUB). It is possible to take a USB output from this USB HUB section and feed it into any USB DAC such that it benefits from a clean USB signal. If this is all the functionality you require then standalone ISO-HUB is the device for you. If you want a USB to S/PDIF converter then ISO-SPDIF is your target; ISO-DAC is the complete one-box USB isolated and relocked DAC. 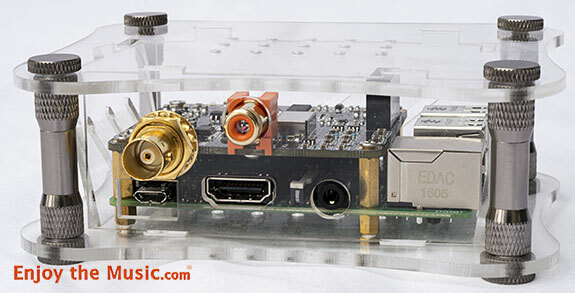 The ISO-SPDIF and ISO-DAC use the Amanero USB receiver board. In both cases the I2S ("I Squared S" is a clock and data bus) output from the Amanero USB receiver is then reclocked utilizing low jitter clocks. Finally the I2S output feeds into either the DAC or S/PDIF transmitter depending on the ISO device in question. Ciúnas Audio was initially known for DACs powered by LiFePO4 rechargeable batteries. These rather special batteries are still very much part of the secret sauce – except that it's no secret! On the face of it batteries fix problems with power supplies; they are relatively quiet and don't pump noise back into your mains the way SMPS wall warts can and do. The battery naysayers will tell you that battery noise actually isn't that low and that chemical reaction noise is an issue. Likewise you may be told that their impedance isn't low enough so they need a capacitor on their output. The naysayers are partially correct as what they say is true for some batteries, e.g. sealed lead acid types. The A123 LiFePO4 batteries as used by Ciúnas Audio are very different. The A123 LiFePO4 are 2.5 AmpHour batteries capable belting out 120 Amps for 10 seconds – "belting" being a very appropriate word! They can even pump out 50 Amps continuously, providing they are being topped up at a suitable rate. Four batteries can be wired in series to produce 13V, these small powerhouses can then perform their party trick of starting car engine; imagine trying that with a few AA batteries! Ciúnas Audio liken LiFePO4 batteries to a massive capacitor but one which has very low impedance at 6mOhms which betters pretty much any capacitor. Noise is very low and stable. The ISO-DAC, ISO-SPDIF and ISO-HUB are all powered by LiFePO4 batteries as well as the ISO-PS which is a standalone power supply. Naturally the batteries need to be charged. The devices come with a beeper which will warn you should the battery voltage drop too far. The recommended approach is to leave the devices on trickle charge continuously. Should you prefer to switch off your charger make sure you unplug the charger from the device as otherwise it will discharge the battery over time - about a week. You may at first think it strange that a charger isn't included with your purchase but Ciúnas Audio see no point in shipping yet another USB charger for your collection, most people have drawers full of the darned things. With the device you purchase you will also receive two USB power cables to connect typical USB chargers to the device. You also have the option to charge the batteries from your computer USB ports. Allo are a high tech company who design in France and manufacture in India; they produce communications products and single board computers along with isolators, reclockers, DACs and amplifiers for the likes of the Raspberry Pi. The Allo DigiOne is a board which sits on top of a Raspberry Pi 2 or 3, it's what's called a HAT (Hardware Attached on Top). 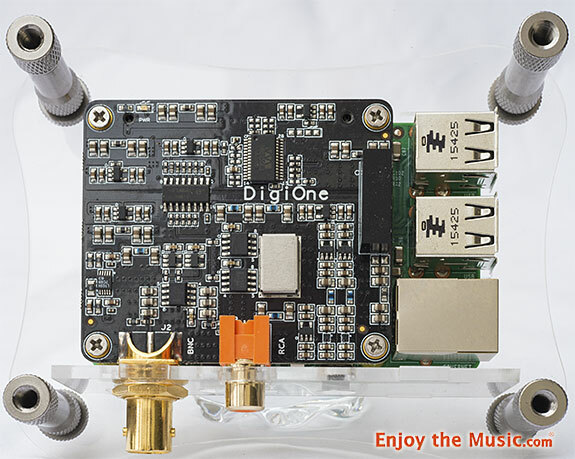 The DigiOne provides the RPi with an S/PDIF output to drive an S/PDIF equipped DAC. Allo tossed out any idea of providing a TOSLINK fibre option due to inherent high levels of jitter – why build a low jitter solution and then corrupt it with jitter? I get their reasoning. The S/PDIF outputs provided are BNC and RCA; it's great to have both options as it removes the need for converters. The power supply is catered for by 10 low dropout regulators, 12 low pass filters and DC/DC converters. All in all the results are clean power for the board. Galvanic Isolation is via a digital chip which should be a better solution than the typically used pulse transformer. Isolation occurs earlier in the circuit than transformers usually do so this is added goodness as it kills noise as early as possible. Reclocking is no doubt very important; there are two high accuracy clocks which also mean that the rather basic clock of the RPi can be ignored. The S/PDIF transmitter is the Cirrus Logic WM8805. I've spent over five months listening to the various combinations of the Ciúnas Audio and Allo devices. The potential number of combinations was mind boggling at times. Rather than make snap judgments when rapidly swapping kit around I lived with setups for a while to form a longer term view. This is my normal modus operandi; with all the combinations available it all took quite a while. Plenty of jazz by the likes of Art Blakey, Sonny Rollins, Dexter Gordon, Charles Mingus, John Coltrane, Dave Brubeck, Stan Getz. The above is a subset of the current music I use for assessing equipment, naturally over 5 months it's only a flavor of the sort of music I play. My primary digital transport was my fanless Windows 10 computer - i5 Skylake ASUS H110T mother board with 16GB RAM and 1GB SSD. The main player used was the Japanese Nontallion software which usually feeds a REGEN USB regenerator into my Metrum Musette DAC fitted with the latest DAC TWO Broadcast modules. I also used Foobar for when I needed instant access to music as Nontallion requires some time to prepare itself. Nontallion in its more extreme modes (the computer being unusable for other tasks) is a considerable step up from Foobar. The preamp was my trusty AVC-1 from Bent Audio which utilizes Dave Slagle's excellent AVC transformers. Power amps ranged from my usual 300B SE monoblocks, BastanisPanettone (EL84 SE), pre-production Class D monoblocks from Temple Audio with linear power supplies plus supercaps and some vintage solid-state power amplifiers. Speakers were the wonderful Bastanis Sagarmatha open baffles and the snazzy Markaudio-Sota Viotti One. Windows 10 USB to USB DAC: Ciúnas Audio ISO DAC. I suspected and maybe even hoped that the ISO-DAC would be the top of the tree in terms of sonics but I was nonetheless very interested to find out how the simpler RPi setup would fare. If the RPi could equal my Windows setup it would be quite a coup. Setting up the ISO-DAC is easy enough, make sure the batteries are charged and then plug it into your computer. It will run without a special driver with MACs and Linux. Under Windows 10 it should run with the latest Windows driver; if not there is also a driver available for download and there are downloads for earlier versions of Windows too. The ISO-DAC and the other ISO devices are all small; they will take up little room on your hi-fi rack. 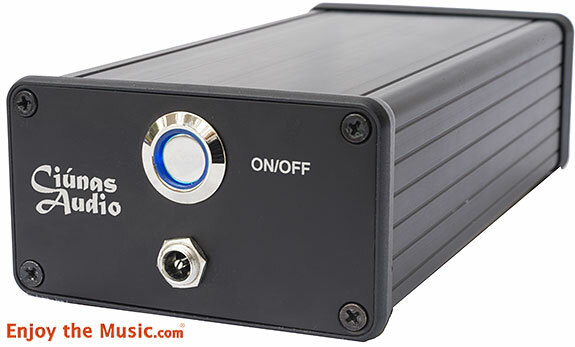 When comparing DACs the biggest differences are usually between Oversampling and Non-Oversampling (NOS) DACs. Even then the differences are comparatively subtle; I say comparatively subtle, what I mean is compared to the differences between record decks, which can be massive. My usual DAC is a NOS type so the ISO-DAC should not sound the same as the Metrum Musette but I really rate the Musette fitted with DAC TWO Broadcast modules so would this be a tough challenge? Running my favored Nontallion player on my fanless PC into the ISO-DAC I was immediately struck by the sound possessing a high level of precision. It was a very tight and bold sound with loads of detail. Some equipment can deliver this type of sound but it can be due to a lack of bass or losing the trailing edge of notes. This is far from the case here; bass is full, detailed and textured. In terms of decay & trailing edges, it's all there. This results in a high level of presence and realism; there's great depth and 3D imaging to the level that my best turntable can achieve – so often I find this is a weak point of digital. Switching back to the Musette I was surprised by the level of difference I observed. It still sounded great but it's a very different beast to the ISO-DAC. The REGEN / Musette pairing is wholesome sounding; it's not rolled off at the top-end the way some NOS DAC are. Some would say the Musette is very analog sounding; certainly it's easy to listen to, smooth, flowing and detailed. It certainly isn't "pipe and slippers" but there is a hint of it being pleasantly relaxed. The ISO-DAC is more about precision, detail and clean sound. For me this is what good digital reproduction would be expected by most people to deliver, though it rarely does. It was at this point where "digital done right" came into my mind. I feel this phrase encapsulates what the ISO-DAC delivers. Do I prefer the ISO-DAC to the Musette? As ever it's down to synergy. Paired with the Bastanis Sagarmatha speakers powered by the Bastanis Panettone EL84 SE amplifier I feel the Musette works better in this situation. The Panettone possesses a strong top-end with slightly curtailed bass, the character of the Musette is a good foil for the character of this amplifier. When substituting my 300B amplifiers I'd say the resulting sound when swapping DACs is much closer than it is with less characterful amplifiers. The 300Bs are dominating the sound. Moving to Class D from Temple Audio, the 70 Watt monoblocks in many ways mimic the sonic characteristics of the ISO-DAC; I'd expected this pairing might sound too detailed, too clean. This was not the case. The Temple amplifiers let the "digital done right" characteristics shine through; there was none the 300B character hiding the strengths of the ISO-DAC. Don't get me wrong; the ISO-DAC sounded great with the 300Bs but they didn't let all of the ISO-DAC goodness shine through – rather like running a Ferrari on tires meant for a family saloon (sedan). Whilst I was making these comparisons I also tried a couple of more classic and traditional solid-state amplifiers. These were a Quad 306 (with DADA Electronics modifications) and a Philips Black Tulip 380 100W power amplifier – both of these amplifiers can hold their own against much more modern designs, indeed the Philips whilst being a 1980s design, was ahead of its time and is a pretty current design for a Class A/B amplifier. The ISO-DAC worked well with these two Class A/B solid-state amplifiers, much as it did with the Class D Temple. The conclusion I reached is therefore that the ISO-DAC has much to offer in terms of precision, clarity, presence, being even-handed across the whole frequency range, great detail and atmosphere. To hear the ISO-DAC at its best you need to ensure you partner it with equally capable electronics if you're not going to brush over some of its class-leading characteristics. Please don't come away thinking the ISO-DAC is clinical with all that detail and precision. It is very natural sounding, there is zero harshness. Sibilance is totally natural. Well recorded double bass such as I find on Oscar Peterson We Get Requests is totally unctuous, the recorded ambience is simply sublime. More modern recordings such as Kraftwerk's Man Machine possess pile-driving deep bass; this too is reproduced so well; not unctuous this time but quite menacing instead. Magnificent! The mid-range and treble can play similar tricks – i.e. it can be old school and characterful when the recording justifies it yet powerful and detailed as is more the way with modern recordings. Oh yes, vocals; Alison Krauss Windy City is just wonderfully captivating. Alison's vocals are entrancing, had there been any harshness there her vocals would have highlighted it. There wasn't a single moment of discomfort; instead there was simply pure pleasure. Like I say, "digital done right". To put the ISO-SPDIF through its paces I connected it between my fanless PC and Metrum Musette which possesses two S/PDIF inputs. As with ISO-DAC the ISO-SPDIF includes Galvanic Isolation, full USB reclocking and regeneration. When making comparisons I naturally questioned whether the USB and S/PDIF inputs on the Musette are of similar sound quality. There are too many variables involved to be sure about the comparative natural of the two inputs but I doubt they sound so very different from each other. 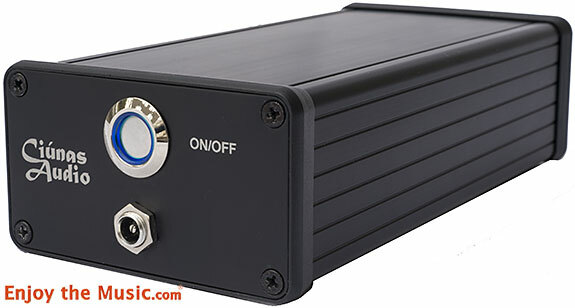 The chances are that customers for the ISO-SPDIF have a very nice S/PDIF based DAC and want to connect it up to a computer to play music. Will the USB conversion do justice to their music and existing DAC? The short answer is yes. I compared ISO-SPDIF into the Musette versus REGEN / Musette. I found the bass was a little tighter and cleaner with the ISO-SPDIF and it served up that trademark precision. I then compared ISO-SPDIF / Musette with ISO-DAC; the differences were close to what I encountered when comparing REGEN / Musette with ISO-DAC; the character of the NOS and OS DACs come to the fore. My feeling was that S/PDIF is close to USB in terms of sound quality. 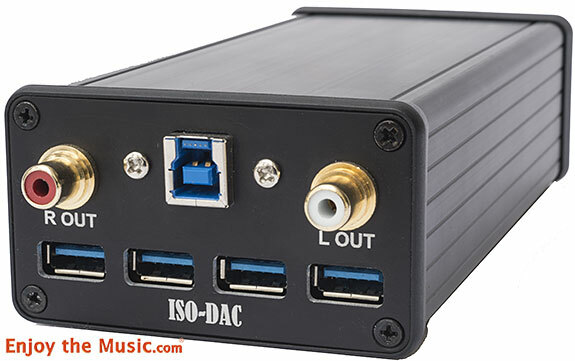 If you have an S/PDIF DAC you want to connect to USB then don't fret, the ISO-SPDIF will do a grand job and Allow the character of your existing favored DAC to shine through. I've been running an RPi 3 into a Metrum Octave DAC for over a year; this is in my study system. The RPi had a HiFiBerry Digi+ installed to provide the S/PDIF output for the DAC. I ran the RPi from a 26,800 mAh battery. This is a battery by Ravi, maximum current is 2.4A so it is perfectly capable of powering the RPi. I tried a number of similar USB charger batteries and the Ravi was the one I was happiest with; some sounded quite poor. The Ravi resulted in a noticeably better sound from the RPi than a couple of switched mode wall wart power supplies I tried. I was really quite content with the RPi plus Digi+ in my study system. Having tried it in my main system I knew it wasn't up with my fanless computer and Musette DAC but any sins were not objectionable, they were sins of omission i.e. reduced dynamics and detail rather than any nasties. I should add at this point that I have setup the RPi to play music from a USB disk drive. For the very best performance it's generally understood that using Network Attached Storage (NAS) via Ethernet cabling to your router and then Ethernet to the RPi will give the best sound. I don't particularly want to purchase a NAS costing a heck of a lot more than the RPi and cabling with Ethernet from my router to the RPi would be royal pain too so I stick with USB. My reasoning for using the RPi in the first place is that it's a simple setup that I can move from room to room easily. Ethernet and NAS make it too unwieldy for my purposes. The software I run on the RPi alternates between Volumio and MoOde, I find they sound the same and the user interfaces are very similar. The AlloDigiOne attracted my attention as it incorporates digital isolation, reclocking of the S/PDIF and does a lot to improve the quality of the power from the RPi to the digital output section. The DigiOne arrived with an Allo perspex case for the RPi + DigiOne. Within a few minutes I had installed the new board and assembled the case. Hooked up to the study system I immediately heard a significant improvement in detail and clarity. Moving the RPi to the main system was equally revealing. The RPi could now mix it with my Windows computer. It was comparable to Foobar on Windows, I wouldn't say it was the same as there were differences in dynamics and levels of fine detail. To most people and in most systems the differences would be very minor. The deciding factors between RPi and computer would likely be around ease of setup and ease of use along with what kit people have lying around already. When put up against the Nontallion player on Windows I found the RPi was still behind but it put up a good fight. Nontallion provides greater depth and dynamics plus more drama. Next up I needed to see what could be done to help the RPi along to further challenge my Windows machine. The battery power supply I was using lasted a long time, i.e. a few listening sessions but it's a niggle as I was never sure when sound quality would drop due to the batteries discharging so I was putting it on charge quite often. I then tried anSbooster linear power supply; this gizmo with is named BOTW P&P ECO 5V - 6V. Set to 5V it easily powers the RPi even with a USB powered disk drive attached. The results were a pleasant surprise as the sound with the Sbooster was improved versus the Ravi battery. The regulator in the Ravi will be nothing like the quality of the regulator in the Sbooster so I'm sure this is a factor in what I heard. The main improvement I noticed was in dynamics, not a massive boost but a useful improvement. A mains linear power supply is the way to go with the RPi. Does this statement stand up when I have Ciúnas Audio battery powered products available? 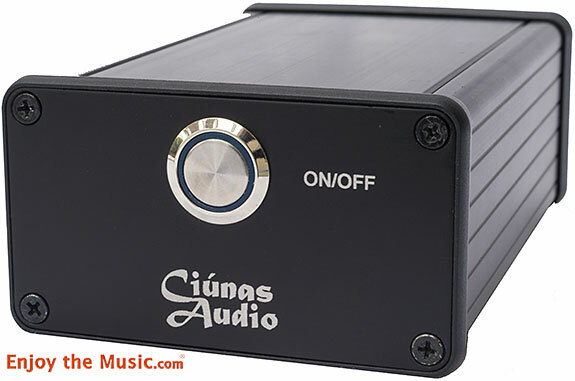 In discussions with John Kenny of Ciúnas Audio I was advised to try ISO-PS to power the RPI. 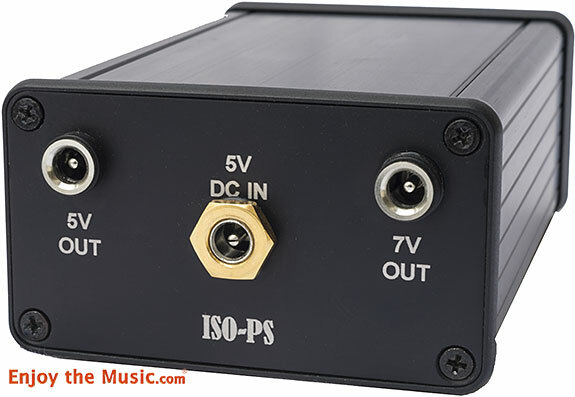 The ISO-PS battery power supply offers 5V and 7V outputs; there are no regulators after the batteries; it seems this is key to their performance. To be able to supply the fairly current hungry RPi I needed to connect a charger to the ISO-PS which was rated at 2A or more. The Sbooster at 3A was ideal as was my HDPLEX linear power supply. Both frankly are total overkill, a 3A SMPS wall wart would be just as good in this situation. My first discovery was that the USB powered disk drive I had connected to the RPi was using too much current for the ISO-PS to reliably deliver. I swapped to a self-powered USB drive which when I tested with the Sbooster I found improved the sound, it was just that bit cleaner. I then swapped to the ISO-PS and yes the effort was worthwhile. This was my best sounding configuration to date; I'd say it was more assured sounding, more composed too. Certainly an ISO-PS powered RPi with the Allo DigiOne is an admirable rival for Foobar on Windows. I didn't have an ISO-HUB to hand but both the ISO-DAC and ISO-SPDIF include the ISO-HUB functionality to isolate and reclock/ regenerate the USB data stream. I was therefore able to use the ISO-S/PDIF to faithfully replicate what a standalone ISO-HUB does. I had two possibilities to try and I'm sure others can come up with more ideas to check out. Firstly I tried playing music from a memory stick plugged into the ISO-HUB USB port of which there are four. The memory stick requires power; the ISO-HUB USB ports are purposely not powered. What's needed is that you inject 5V of good quality power into the right hand USB port; this is then distributed to the remaining three USB ports. I used the ISO-PS to provide 5V power as this was easily the best power source I had available. The ISO-HUB was connected to my Windows PC via a USB cable so the PC saw the music files I had on the memory stick as another USB drive. In my situation the resulting sound of music played via ISO-HUB & a memory stick was on a par with music stored on my SSD. My fanless PC is an electrically reasonably quiet and well behaved device. My guess is that for someone playing music on an electrically noisy laptop they might well find that an isolated, reclocked/regenerated USB data stream is beneficial vs music stored on the laptop. My second experiment with the ISO-HUB was to place it between my USB disk drive and RPi. This time I heard the typical benefits of isolation and reclocking/regeneration; greater clarity and precision. It seems the notoriously noisy RPi being isolated from its USB drive is worthwhile. My intention with this article is not to see it as a shoot-out but instead explore some options to configure a files-based playback system. I should imagine that most readers will have a DAC or a computer to begin with; I'm not suggesting throwing out existing kit, rather I'm looking at ways to enhance what you already have. If I were starting with from scratch then my fanless Windows PC running Nontallion feeding the Ciúnas Audio ISO-DAC is the leading solution here and this is what I'd aspire too. I am convinced by the isolation and reclocking/regeneration implementation which Ciúnas Audio have included within their devices; this functionality being within the device makes for a neat setup vs needing to plug in a separate device. LiFePO4 battery power is winner too. The ISO-HUB can be used as an external device should one be needed to update an existing DAC or disk drive. I believe the isolation and reclocking/regeneration techniques used with the ISO products are a real step forward for digital replay at a relatively affordable price. The signature of the ISO devices is one of precision, detail and life. 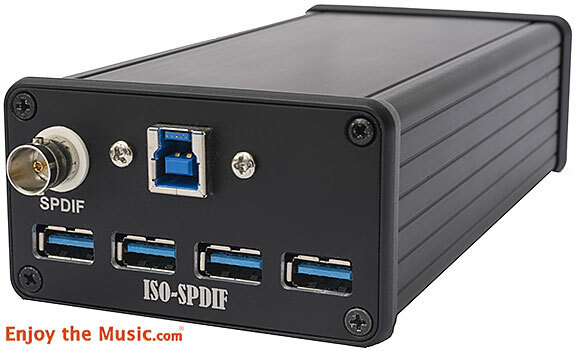 For those with an S/PDIF DAC I can heartily recommend the ISO-SPDIF for those with a PC (Windows, Apple or Linux) to connect to their DAC. For those eschewing PCs then the Raspberry Pi has fully come of age with the addition of the Allo DigiOne S/PDIF board, ideally with power supplied via the ISO-PS. There are many options; maybe one of these options will form the basis for enhancing your digital playback. I have to say it again – digital done right! Note: prices are shown without tax. For Europe add VAT at 23% as the products are shipped from Ireland. Outside of the EU no tax is charged but duty will be a payable at your usual rate. - Available in Clear and Black, and your choice of Black or Silver Standoffs. Note: prices are shown without tax; check the Allo website for prices with tax.